Have you ever considered how useful it would be to be able to schedule reports in Chris21 to run automatically at regular intervals? You may have a report that is required by finance after each pay run. Scheduling this report will mean you no longer have to put in the time and effort to do it yourself. It’s not just reports that can be scheduled. You can also schedule processes in Chris21 to run automatically. A good example is the Background Administrator process which is part of the Chris21 housekeeping procedures that administrators usually perform. 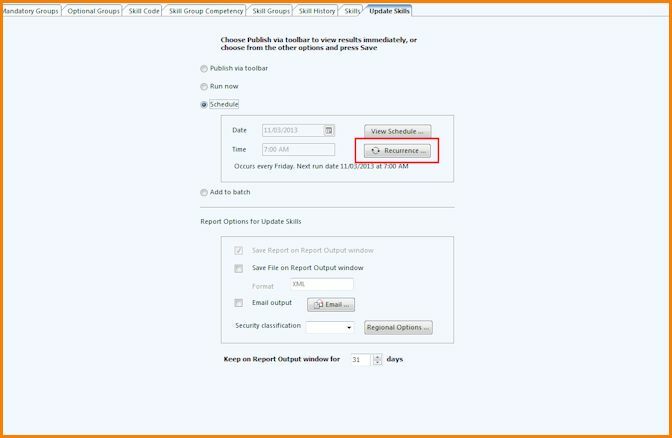 If you haven’t tried to schedule reports in Chris21 before, you may be surprised at how easy it is to do. I’ll run through an example. 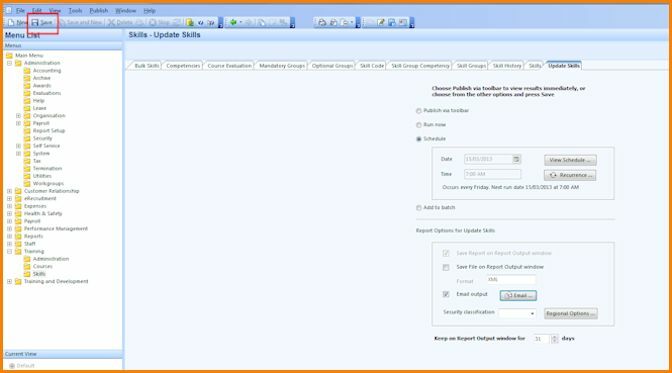 In our example we will schedule the Skills Update (SKU) process to run on a weekly basis. The Skills Update process will transfers skills learned in a training course to attendees Skill (SKL) records. For a detailed description of this process see Updating Skills in Chris21. As you can see from the Recurrence dialog box above, you have the options to schedule you reports to run daily, weekly or monthly and you can also choose the days of the week. 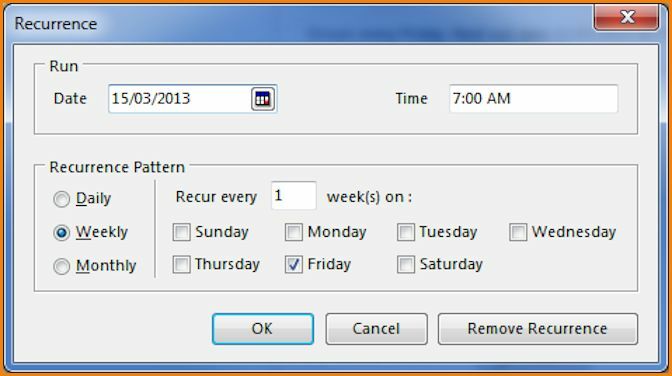 If you want to schedule a report to run daily but not on weekends, select the Daily radio button and then check all days of the week except for Sunday and Saturday. Click the OK button to save the recurrence. 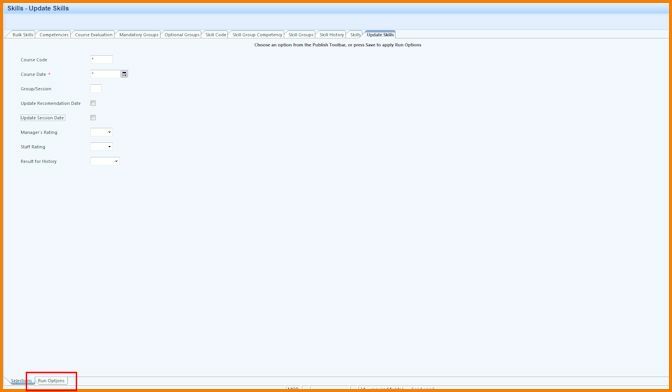 The process will create an output file that shows all records that were updated by the process. You can choose to email this output file. For example, your organisation may employ a training administrator to manage your training database. This person my request that they receive the output file via email. Click OK when you have finished setting the email information, then click the Save button to save this schedule. The process is now scheduled to run beginning on the 15/03/2013 and will continue to run each Friday at 7AM. 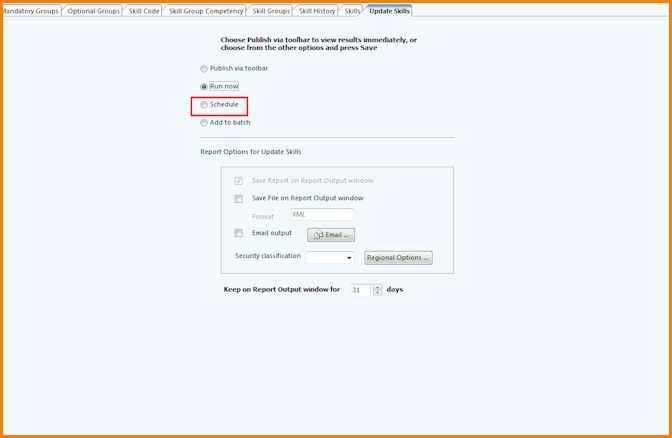 Follow this process to schedule reports in Chris21. A simple tip to help make your life easier! How to turn off a report that you no longer require please? 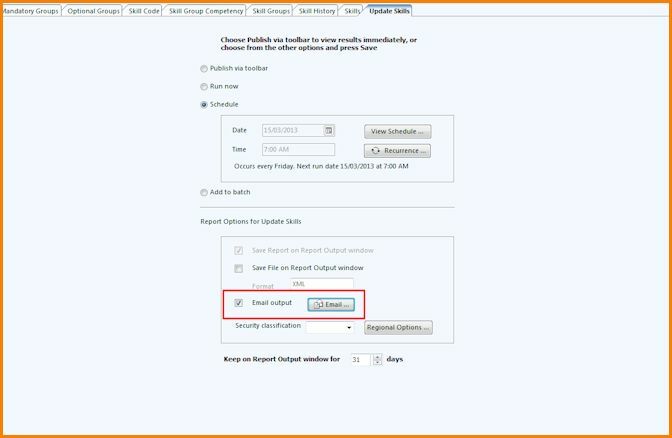 If it’s scheduled you can delete it from SRP. Hi Karyn. You can schedule a report to go to a folder using FLC. Just make sure the chriscs user account has access to the folder you want to send the report to.